Who needs a blanket to cover up while breastfeeding now that nursing covers or “hooter hiders” are being made for women who want to breastfeed in public, but still be private. About a year ago I saw a few of my close friends using “hooter hiders” and I was amazed at how simple and yet effective they were and I thought that if I ever had a child I would definitely want one. Now I am pregnant and still want one. I know there are debates about whether or not to cover up in public, but for me, even though I consider breastfeeding to be completely natural and a beautiful thing, I am modest and want to be discrete. Some people have also stated that a nursing cover brings more attention to a nursing mother than not using one, but Iï¿½d rather have someone gawk at my cover than my exposed breast. I mean, reallyï¿½men and even women canï¿½t help but stare at something that is out of the norm. I personally donï¿½t want that kind of attention. Because I loved the idea of a nursing cover so much, I decided to make my own. They are relatively easy to put together and I found that sewing was a great way to relax. I’ve already made about six nursing covers and I may even start a little side project with my mom making them for friends and whoever else I run into that’s interested. The fun part is choosing the fabrics. There are so many fun colors, prints and textures…it can be hard to decide. I also like that so far each one has a different fabric so that they are all unique in there own way. Below are pictures of a few nursing covers I’ve made so far. I’m not sure if this will turn into anything, but I’m having fun with it for the time being. Check out our ETSY store for some of Julia’s creations. I finally made the call. I wasn’t sure if I really wanted to take a class through our healthcare provider and I figured that most of the topics of discussion would be covered in my reading, but after much thought I realized that going to an actual class with my husband would be a good way for us to actively participate in learning about what to expect in the laboring process. I also figured I can use what information I find to be of use and anything I don’t necessarily agree with, I can consider it void, but at least I was given the information. We start October 8th and finish November 12th. I attend Kaleo Church of San Diego and I love how they don’t hide behind walls, but instead they come right out and say it. The way they describe the gospel is the same. Read below and you will see what I mean. The Gospel is not that we demonstrate our own righteousness before God and then He owes us something, but that He demonstrates His righteousness through Jesus Christ and then freely imputes His righteousness to us (2 Cor. 5:21). The Gospel is not that “it doesn’t matter what you believe, as long as you’ve been good,” but that “it doesn’t matter if you’ve been good, as long as you believe in Christ as your Savior.” The Gospel is not that we go from being irreligious to being religious; it’s that we realize that our motives for both religiosity and irreligiousness were essentially the same and essentially wrong—that we were seeking to be our own saviors and thereby keep control of our own lives. To the degree that we rely on something other than Jesus to save us (such as moral performance, career, romance, family), we experience anger, fear, guilt, and despair. To the degree that we rely on something other than Jesus to save us (such as moral performance, career, romance, family), we experience anger, fear, guilt, and despair. But when we trust in Christ as our Savior, we no longer trust in our own self-determination or self-denial for salvation; neither do we trust in moralism or hedonism for our security and comfort. Kaleo assumes that most people have not heard of or thought through the implications of the Gospel. We exist to bring things “in line with the gospel” (Gal. 2:14), which renews us spiritually, psychologically, corporately, socially. The Gospel avoids the errors of legalism and liberalism, moralism and relativism, yet it does not produce something in between, but rather something different from them all. The Gospel critiques both religion and irreligion (Matt. 21:31). It shows us a God far more holy than the legalist can bear (Jesus had to die because we could not satisfy God’s holy demands) and yet far more merciful than the liberal can conceive (Jesus had to die because God loves us). The Gospel affects everything we do at Kaleo. My grandma is so adorable. She’s excited about a new baby and even though she lives in Arizona, she’s using her gift of sewing to show her support and love for us. This last weekend my mom visited my grandma and while she was there she gave her a ton of baby stuff to bring back to me. She made 4 blankets, 5 crib sheets with matching pillowcases, a boppy with 2 slipcovers, 4 or 5 towel sets that have adorable appliques attached to each one as well as an extra pillow for the pillowcases. I was surprised when my mom showed me the pile of stuff she had made. My grandma is truly amazing. My grandma called me this past week and I told her what a busy bee she had been and she told me that she did it all in 2 weeks. Wow! I have three months left and I’m wondering how much more she’s going to create within that time frame. Go Grandma Go! 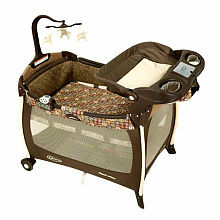 I check my baby registry periodically and I saw that someone bought us our first baby item, the Graco pack-n-play. What a blessing! The pack n play was one item that we definitely wanted because of its versatility. It’s a play pen, a portable bed, a bassinet and a changing table all in one. Our thought was to set it up in our bedroom for the first few months of our sons arrival so that he would be close by as well as for the convenience of getting him up for the many late night feedings and diaper changes. These are the little things that excite and remind me that soon my son will be born and what a joy he will bring to our family. After my first stretch mark appeared I shared my disappointment of how my belly butter wasn’t working to my mom. She mentioned I try jojoba oil. After doing a little research I found out all the great benefits of using jojoba. Actually, jojoba oil is not really an oil but rather a wax ester. You can find it in your local health food stores and in the naturals sections of grocery stores. Refined jojoba oil is a colorless and odorless oil and doesn’t leave an oily residue like other oils do. It’s ideal because it’s inexpensive, easy to find, and has many practicle uses. Jojoba oil can be used as a body oil, moisturizer, hair treatment to prevent dandruff, make-up remover, lip balm and much more. Who knew!?! I wish I had heard about jojoba long ago. I easily found it at my local health food store and it was even on sale for $5.99 for a 4FL bottle. I am excited to see if this natural topical will help moisturize my growing belly and help reduce the chance of future stretch marks. My husband and I went camping in our local mountains over Labor Day weekend with a small group of people from our church. I was a little worried that it would be too hot to function, being 6 months pregnant and all, but it actually ended up being a beautiful weekend up in the Laguna Mountains. The clouds and gentle breeze helped keep us moderately cool and the company was cool so I guess that helped too. We enjoyed hanging out, reading, talking with our friends, eating, resting, munching on smores, playing card games and taking in the nature around us. Overall, it was a great time. Sleeping was a completely different situation. Sleeping on the ground, even with an air mattress was painful for me. By Sunday I was so ready to go home and sleep in my own bed. My recommendation for women who are 6-9 months pregnant, think twice about tent camping. If you’re a trooper and don’t mind sleeping on the ground and roughing it some, then by all means go for it. Don’t get me wrong, I enjoy camping very much, but I think I’ll pass on the next camping trip until my son is born and is at least 8-12 months old to try the whole camping experience once again. What does it look like to raise a boy to become a man? In the near future my husband and I will be faced with many decisions that will determine how our son will speak, learn, play, interact with others, love, understand God…etc. These may all sound like little things, but these little things add up to the boy we are raising to become a man. For instance, if we choose not to discipline our child when he disobeys, what are we teaching him? If we don’t address his disobedience right away we are promoting rebellion and bad behavior and if not addressed early on may continue through his adulthood. If we choose to ignore his frustrations and throw him into time out we are not allowing him to learn how to communicate his frustrations and feelings to us and to others and if not addressed early on may also continue through his adulthood. All these little decisions and ways we go about raising our son can have a chain reaction effect on how he chooses to behave and live as a grown adult. It may not seem that way when they are at that young and innocent stage, but they do eventually grow up. I know my son isn’t born yet and my husband and I will find ourselves wrestling with these issues, but my hope is that we will continue to remind ourselves that our ultimate desire is to raise our boy to become a responsible, honest and God honoring man and in so doing we must remind ourselves to be consistant in our actions and continue to pray to God for guidance and wisdom in every decision we make for the sake of our son and to bring God glory. Company Kids is the perfect website to find an array of fun and unique items for children. They have a plethera of bedding, apparel, toys, seasonal items such as halloween costumes and even rugs and window treatments that boys and girls will both love. I give their designers a big thumbs up. Good job Company Kids! One item that particularly caught my eye were the shark towels. They are unique and not something you see everywhere. 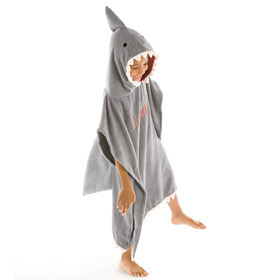 I know my husband would also love them because he is fond of sharks as you can tell just from his web name archshrk.